Irving Berlin said it best: ""Tuneful, tasteful/Soulful, smart/Music - Rodgers/Lyrics - Hart." Although the R&H Theatre Library was founded by Richard Rodgers and Oscar Hammerstein II to license their own musicals, we are equally proud of the many authors whose musicals we now represent including Mr. Berlin, Kurt Weill, Andrew Lloyd Webber, Bock & Harnick - and Rodgers & Hart. Among our many noteworthy Rodgers & Hart productions of the past few years: ON YOUR TOES, the first musical staged by the Stuttgart Ballet (1990), revived in the company's 1993-94 season and followed by a Japanese tour; a staged reading of I'D RATHER BE RIGHT given at Arena Stage in Washington D.C., featuring cameo appearances by members of the Clinton cabinet and the 103rd Congress (March 1994 - see HAPPY TALK, Vol. I, No. 3); the rarely-seen PEGGY-ANN revived by San Francisco's 42nd Street Moon Productions (1993); THE BOYS FROM SYRACUSE given a jazzy, multi-ethnic production by Atlanta's Alliance Theatre Company (1994); a concert presentation of BY JUPITER presented by Musical Theatre Works at New York's Town Hall (March 1995); and Encores! Great Musicals in Concert's PAL JOEY at New York's City Center starring Patti LuPone, Peter Gallagher and Bebe Neuwirth (See story page 5). The golden age of the Rodgers & Hart collaboration lives on in the R&H Theatre Library catalogue: ON YOUR TOES (1936) Hot American jazz confronts regal Russian ballet when a vaudeville hoofer mixes it up with a prima ballerina. This stylish, riotous romp includes "There's a Small Hotel," "Glad To Be Unhappy" and "The Heart Is Quicker than the Eye" along with hilarious dance parodies and a ballet that has become a classic in its own right - "Slaughter On Tenth Avenue." The phrase "Hey kids, let's put on a show!" has become part of the American vernacular, and the youthful hope and enthusiasm it represents runs rampant in this classic musical comedy. The astounding score includes such standards as "My Funny Valentine," "Where Or When," "The Lady Is A Tramp" and "I Wish I Were In Love Again." A Democratic President takes on Washington after twelve years of Republican rule and when he's not battling Congress, he's trying to rein in his First Lady. A far-fetched scenario, of course, but the sure-fire stuff of political satire. 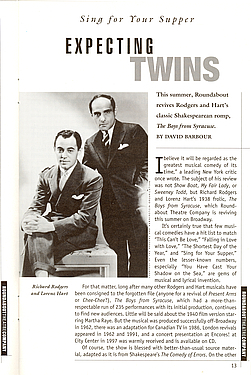 And here's a musical with plenty of Hart - the wonderful Rodgers & Hart score combined with a book by the masterful George S. Kaufman & Moss Hart. When a banker is granted his wish, an angel is brought down to earth for a match made in heaven. To the beguiling strains of "Spring Is Here," "A Twinkle In Your Eye" and "How To Win Friends And Influence People," this celestial confection transforms urban cynicism into wonder and romance. Twins! Slapstick! More twins! Maidens chaste and chased! This comedy of errors remains the most enduring and endearing musical descendant of the Bard. The play was already hilarious, but the Rodgers & Hart score makes it a pure delight, featuring "Falling In Love With Love," "Sing For Your Supper" and "This Can't Be Love." Musical comedy grows up in this sassy story of a smooth-talking cad who meets his match in a cool society dame. The sophisticated narrative is propelled by a smashing score that includes "Bewitched, Bothered And Bewildered," "I Could Write A Book" and "You Mustn't Kick It Around." Girl gets boy when a battalion of Greek warriors are brought to heel by any army of Amazon women. The guys find the issue of equal rights taking on a new urgency when the sandal is on the other foot, but the stand-off is abated with a superlative score which includes "Everything I've Got (Belongs To You)," "Wait Till You See Her" and "Nobody's Heart." Maybe the best birthday party is a celebration that's all Hart! This smart and elegant revue sets the stage for romance in the first act, saving the more satiric gems and peerless comedy numbers for Act Two. 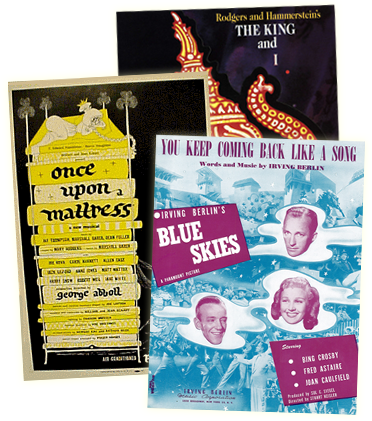 You can't go wrong with over two dozen of the best songs ever to come from the musical stage and screen including "Manhattan," "Blue Moon," "With a Song In My Heart," "Isn't It Romantic?," "Little Girl Blue" and "The Most Beautiful Girl In The World." Contact The R&H Theatre Library at 229 West 28th Street, 11th floor, New York, New York 10001. Phone: (212) 564-4000; Fax (212) 268-1245.